As part of Performing Books # 2, exploratory format initiated by BAL Books, LE BAL presents artist Hannah Darabi’s project around her collection of photographic and political books. 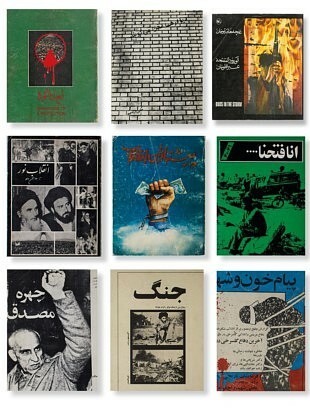 Published in Iran between 1979 and 1983, a short period of relative freedom of expression corresponding to the end of the Shah regime and early Islamic government, these books show an intense political boiling and new wind blowing on Iranian photography. This period, fundamental to understand the history of this country in the 21st century, is deciphered by Chowra Makaremi, anthropologist and researcher at CNRS. In order to offer another reading of this collection, Hannah Darabi will, in a personal work entitled Reconstructions, dialogue her books with contemporary photographs of her hometown, Tehran, and vernacular images such as family photos, media images or maps. The exhibition will end on Monday, February 11th, on the anniversary of the Iranian revolution, with a day of talks and conferences coordinated by Chowra Makaremi. It will be accompanied by a book co-edited by LE BAL and Spector Books designed by Hannah Darabi with the contribution of Chowra Makaremi.